Nick Caley was promoted to tight ends coach by the New England Patriots, the team announced Monday. This promotion comes just shortly after Brian Daboll left to become the offensive coordinator at Alabama. 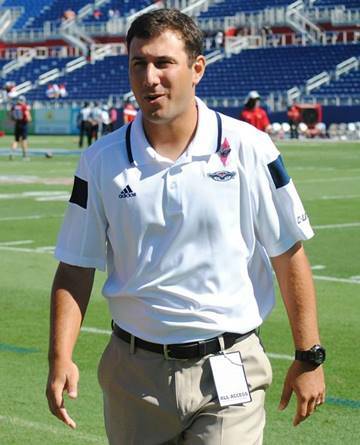 Caley brings both college and professional experience and familiarity to his new role. He coached in the college ranks for 10 years, and was an assistant for the Patriots the past two seasons. Caley’s collegiate coaching experiences include working at John Carroll (2005-06), Akron (2006-07), Auburn (2008), Iowa State (2009-11), Eastern Illinois (2012), Arkansas (2013) and Florida Atlantic (2014). The new tight end coach will now get to work with Rob Gronkowski, Rob Housler and Matt Lengel. With Martellus Bennett likely leaning toward finding a new home in the NFL, Caley and the Patriots may want to look for a few more TEs in this year’s draft.